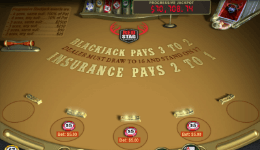 Progressive Blackjack is a new twist on traditional Blackjack games. Despite the name, it’s not a game where you listen to 90s grunge rock and don a Kurt Cobain sweater while playing Blackjack. The game itself is played by standard Blackjack rules and there is absolutely no difference in action during the hand. The difference comes with the addition of the progressive side bet that can be placed before each hand. The progressive bet lets you try and win a progressive jackpot that is attached to the game by making certain combinations of hands. 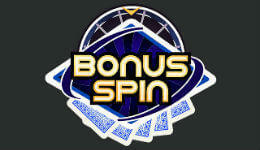 Depending on which casino you are playing at will determine the exact combinations that pay out. Some combinations pay a portion of the jackpot, while others may pay out the entire jackpot. By our nature, we are quick to get use to things, something that was exiting just a day ago, might appear boring today. That’s why Progressive blackjack rapidly grows in popularity, both in land based casinos and online blackjack sites. Progressive jackpots are very common in slot machines, but they can be found in many casino games. Caribbean Stud for example was a dying game until the addition of the Progressive Jackpot. The jackpot is called progressive because it gets larger every time someone places a bet to win the jackpot. For example, if you place a $1 bet on the progressive jackpot – in case you don’t win, part of your $1 will be added to the jackpot. Some of these jackpots can be worth millions, therefore it’s not a big surprise that Progressive Blackjack is extremely popular. Not to mention the addition thrill added to the common game. How to Win Progressive Blackjack Jackpot? 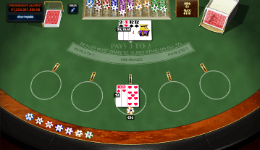 Before each hand is dealt, you can place a side bet that makes you eligible for the jackpot. Usually it’s just $1 at most casinos. If you don’t place this bet, you cannot win any part of the jackpot, even if you make one of the winning hand combinations. As we stated earlier, the casino where you are playing at will determine the winning combinations. You should also notice, that some Progressive Blackjack games let you choose whether to place the side bet or not, while in others it’s obligatory. Here are a couple examples of the more popular rules. While playing Progressive or any side bet blackjack, there are two separate winning odds to consider. First, the basic rules of the particular game and then the odds on the side bet / jackpot. Due to huge difference between one game to another, we can’t give exact odds that will be relevant to all progressive games – those you can find by visiting the specific game page by clicking the images above. In general, side bets, including the progressive jackpot, have much higher house edge than the usual blackjack game. That’s quite understandable: blackjack is one of the best payout casino games, while progressive jackpot resembles a slot machine, which are on the other end of the scale in terms of payouts. That doesn’t mean that you should stay away from progressive blackjack. You just need to be aware of the odds and play it occasionally. And it goes on till 1 Ace. 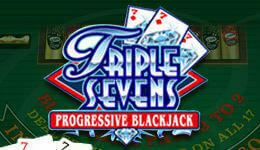 MicroGaming use different combinations of 7’s to trigger the jackpot. To win the jackpot you need to get 3 diamond sevens in a row. Other combinations of 7’s will win portions of the jackpot. (This game is actually a reproduction of the popular Bally Blazing 7s Blackjack Progressive, which you might have seen in Vegas or Atlantic City casinos). Regardless of how you win the progressive jackpot, the concept remains the same. Be sure to check the rules on how to win before you decide to play. If you are looking for an exciting and different way to play Blackjack (plus the possibility to win a life changing jackpot), Progressive Blackjack may just be the game you’re looking for. However, you should remember that the odds are slim and its recommended to limit the side bets to a certain portion of your budget.